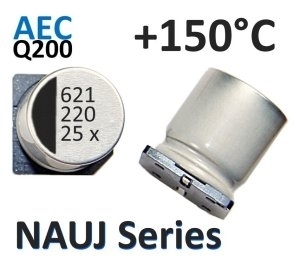 NIC Components is pleased to announce the addition of NAUJ series of ultra-high temperature +150degC rated automotive grade long lifetime capacitors to its expanded family of surface mount (SMT) aluminum electrolytic capacitors. NAUJ series meets automotive grade AEC-Q200 test requirements and features wide operating temperature range of -40degC to +150degC, with 1000 hours load life rating at +150degC (equivalent to 24,000 hours at +105degC and 96,000 hours at +85degC). +150degC rating is ideal for use as surface mount replacement for radial leaded (LDD) version capacitors, when used in long lifetime applications; such as automobile systems, and other high temperature industrial applications. Capacitance value range of the NAUJ series covers 100uF to 470uF in ±20% (M) tolerance, with voltage ratings of 25VDC and 35VDC in 10x10.8mm and 12.5x14mm (DØxH) case sizes. Wide terminal option (‘W’) is offered for use in high vibration applications, such as automotive power train, drive train and industrial controls. Circuit applications for NAUJ series include use as input and output capacitors on DC-DC switchers, point of load regulators, load stepping, bulk storage. Additional uses in ripple noise filtering applications in enterprise level equipment; servers, routers, computing, renewable energy, and lighting displays. NAUJ series is RoHS complaint, and Pb-free SAC Alloy soldering compatibility at +245degC and +250degC reflow soldering temperatures. Unit pricing for NAUJ series ranges from $0.23 to $0.52 in production volumes. Contact NIC Components today for free samples and to review your circuit requirements.